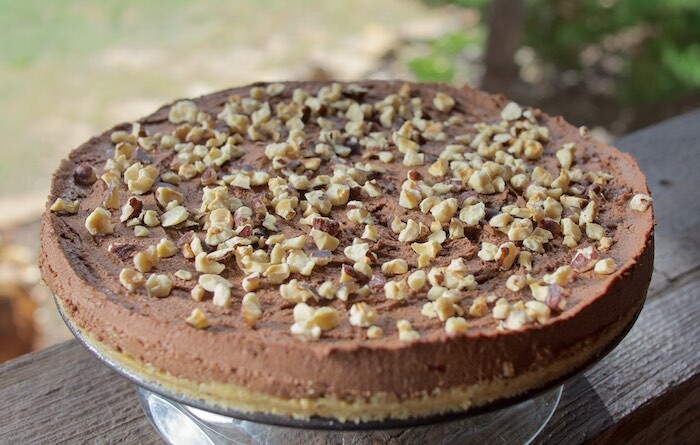 Food Hunter's Guide to Cuisine: No-Bake Chocolate Ricotta Hazelnut Cake for #Choctoberfest! No-Bake Chocolate Ricotta Hazelnut Cake for #Choctoberfest! Welcome to #Choctoberfest, a week long celebration where participating food bloggers share their all-time favorite chocolate recipes from sweet to savory (and everything in between). Be sure to check-in often for delicious recipes. Special thanks to Imperial Sugar and Divine Chocolate for sponsoring this post and to The PinterTest Kitchen. for all their hard work. The first recipe I'm sharing is this incredibly delicious No-Bake Chocolate Ricotta Hazelnut Cake. A simple mousse like chocolate cake with a cookie crumb crust; it that takes less than 30 minutes to prepare, but will need to mold in the fridge for at least 6 hours. In a food processor, combine the hazelnut flour, cookies and sugar. Process until the mixture resembles coarse sand. Add butter and process until combined. Press this mixture firmly and evenly into the springform pan and set aside. Melt chocolate in a heatproof medium bowl in the microwave until melted and smooth, stirring every 20 seconds, for about 1 minute. In a food processor, blend ricotta until very smooth, about 1 minute, scraping down sides of bowl. Add chocolate and blend until smooth. Beat cream in the bowl of a stand mixer until stiff peaks form. Gently fold in chocolate-ricotta mixture. Spoon chocolate-ricotta mixture on top of hazelnut cookie crumbs and smooth top. Cover with plastic wrap and refrigerate at least 6 hours. Before serving remove from pan and top with toasted hazelnuts. No Bake is my favorite, especially when it's chocolate, yummy! I can't believe this is no bake!! I need to try this soon! I love an easy no bake cake! This looks delicious! I love combining ricotta and chocolate in desserts! This is a lovely, elegant looking dessert. I am dying over this gorgeous cake! Chocolate and hazelnut is my all-time favorite dessert combination. I was not expecting this pretty cake to be no-bake! Love it, sounds fantastic! I want to dive head first into this cake. Love hazelnut so this is right up my alley. Theresa!!! This is fantastic. I'd love a slice...and you make your own biscotti. You truly are my hero. Oh wow, before I realized it was a no bake I was thinking "well this looks like it's worth all the effort" now that I know it's NO BAKE - it's a must!